This Custom Marfione Dragonslayer was a project done by master engraver Jody Muller. Muller chose the dragon theme himself and selected choice diamonds for the eyes, an ounce of gold for the inlay and copper for accents. The knife itself has solid stainless handles and a magnificent Bertie Rietveld Blued Nebula AKA Dragon Skin Damascus Blade. Dragonslayers are the rarest Marfione Custom pieces because of the complexity involved in the internal mechanisms and then the grind and polish to the 416 Stainless Steel handles as well as the the blade itself. Currently there isn't another maker in the world besides Tony Marfione who is able to effect such as masterpiece as this . Not a year has gone by that more than 20 were made and there have been many years where none were produced. This Dragonslayer is opened by pressing the button on the front side of the handle - that action will eject the blade into the locked open position. To close the knife you push the liner lock over and pull back on the charging handle at the bottom of the handle until the blade is locked open. Then you return the charging handle to it's locked in position. 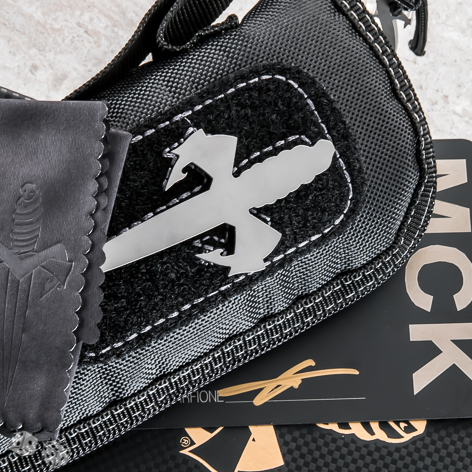 Also includes Marfione Custom Knives presentation box, storage bag, dagger monogram polishing cloth, laser engraved maker signed metal certificate of authenticity and titanium dagger patched custom zip pouch.